The Oregon Wine Blog: A Celebration of Cycling and Wine! If you've been following The Oregon Wine Blog recently, you know that over the past month we've been participating in Le Tour de Vino -- a cycling journey to 6 wineries in the Willamette Valley. The tour brought blown tires, gravel roads, dead ends, torrential downpours, tight spandex, and a lot of great wine and scenery. 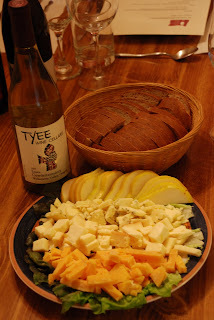 As a finale celebration, Rick and I hosted Drew from TOWB as well as Nick, Kristin, and Chris from Block 15 Brewing Company for a feast featuring local, fresh food and some of the best wine from our tour. and Belle Vallee. Then came the quest of matching gourmet culinary features that would highlight the wine. We consulted a number of resources, but I want to give a plug for a cookbook that provided the majority of the recipes for the evening -- Best Places Northwest Cookbook. The book is amazing and we suggest picking up a copy from Powell's Books in Portland or another fine book purveyor. From there, Rick and I toiled in the kitchen for many many hours, getting ready for the perfect evening. All dishes were made from scratch with the exception of the Lemon Sorbet. Appetizer -- Oregon Honey Wheat Hazelnut Bread with Aged Gouda, Farmstead Smoked Fontina, and Rogue Oregon Bleu cheeses; paired with the 2007 Tyee Gewurztraminer. A great start to the evening, the cheeses were wonderful and our guests noted that the crisp wine cleaned the creaminess of the cheese off of the palate. We're particularly proud of the bread and it was probably the technically best executed dish of the night. Salad -- Pepper Steak Salad with Mango, Avocado, and Jalapeño Vinaigrette; paired with the 2002 Belle Vallee Merlot. We knew we wanted to feature the merlot and also knew it wouldn't pair with our desired main dish, so the challenge became finding a pairing that would work using a non-traditional wine progression. This salad hit a homerun! We found it to be a flavorful, spicy salad with quite a bit of heat, although the avocado and mango had wonderful mellowing effect. The wine stood up to the spice and helped temper the heat. The salad had the best presentation of the night and the merlot was our favorite wine. Palate Cleanser -- Lemon Sorbet. This allowed us to go from the bold merlot with the salad to a more subtle pinot with the main course. Thanks Dryer's! 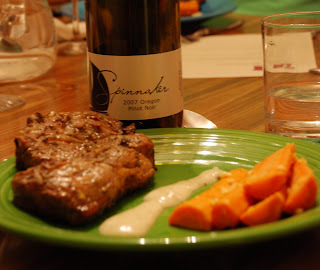 Main Course -- Rosemary Lamb with a Curry Yoghurt Sauce and Ginger-Garlic Grilled Carrots; paired with the 2007 Spinnaker Pinot Noir from Spindrift Cellars. By far the favorite overall dish, the lamb from Cattail Creek was tender, flavorful, and perfectly prepared. The Pinot complemented both the lamb and the carrots, and we couldn't have hoped for a better match. The lamb melted in our mouths and the curry / rosemary flavor profile was exquisite. Dessert -- Espresso Creme Brule with Espresso Crumb Cookies. Initially, we hadn't planned a wine pairing with dessert as we hadn't picked up anything sweet on Le Tour. Also, we figured folks would have had enough by that point in the evening. Well, we ended up cheating and making a last minute addition not from the tour and cracked open 2007 Willamette Valley Vineyards Riesling. The approximately 5% residual sugar was perfect. The creme brule tasted wonderful, however the texture was a bit off due to a broken custard. The cookies, however, were the biggest surprise of the night and melted in our mouths. All in all, Le Tour de Vino Finale Dinner was a smashing success. It was the first time that Rick or I had prepared a multi-course meal of this magnitude, and it was the perfect capstone to a month of biking and drinking. 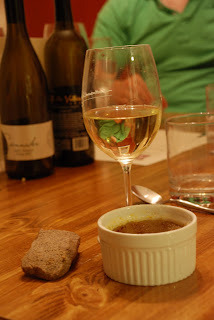 Send me an email if you'd like the recipes and leave a comment and share your perfect pairing experience. "Le Tour de Vino" is such a cool idea and your "show + tell" presentation with dinner party pairings is le pièce de résistance. What a fun summer project! Zupan's -- thanks! We've really enjoyed the tour and the dinner was a great capstone. The Wine Cyclist -- More to come! Congratulations on the complete of your first Tour De Vino! We are thrilled you enjoyed our Riesling with your dessert. We are looking forward to having you pedal on up to our winery next year. In the meantime, catch up on your ZZZzzz's harvest is quickly approaching!